I have been reading and obsessing over English Paper Piecing the last few months. This week, I decided to jump in. As you might imagine, the copy paper was the most pliable, but it provided enough stability while handling and sewing. However, I found it difficult to feel the edge while folding the fabric around it. The most stable was the cardstock, no surprises there. It was easy to fold the fabric over and make a clean crease. The magazine paper was also easy to fold the fabric around. Surprisingly, after sewing, the copy paper flower felt like it had more body than the one with the magazine paper. More on that later. I removed the paper from all three flower centers to see how they fared. The copy paper & magazine papers both looked like something nibbled on the edges — my needle. Both of them could be reused a few times, but probably not more than 2-3 times. The cardstock showed some dimpling around the edges but these likely could be used upwards of 10 times before showing deterioration. The copy paper was the easiest to sew with. The needle could nibble into the edges easily to grab a few threads of the fabric. The cardstock was a different story. I had a really difficult to work my needle into the edges to grab fabric. Part of the reason was that I had a really really taut fold. The other reason is that I used a glue stick to hold the seam allowance down. If I had basted the seam allowance, then I think it would have enough give to allow me to shift the fabric around to bite into the edges. My fingers definitely cramped up while sewing the flower with cardstock. The cardstock was also difficult to bend while working around corners and seams. As I said, I used the glue stick method rather than basting down the seam allowance. 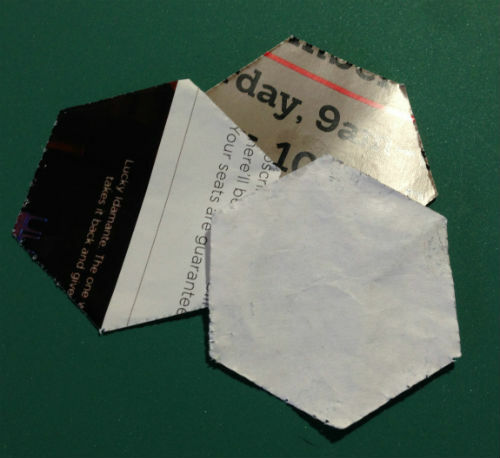 The copy paper was the most difficult to remove because the glue bonded with the paper. Of course, I also just used a glue stick I had sitting around. It doesn’t say if it is permanent or removable. Since it doesn’t say removable, it’s likely to be of the permanent variety. The glossy papers did much better. The glue didn’t soak in so they separated easily. However, the cardstock was a bit too stiff to remove easily. Speaking of the glue soaking into the paper, that is also probably why the flowers with the copy paper felt like it had more body — the body was from the glue soaking into the paper and making it stiffer. My favorite is the recycled heavy glossy magazine paper. How heavy is the magazine paper? For those of you who come here from my spinning posts, think Ply Magazine or Wild Fiber, not Spin-Off. For the non-spinners, think National Geographic, not Time Magazine. 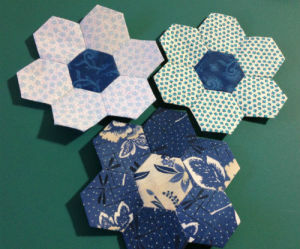 And lest you think I’m crazy for cutting my own hexagon papers, I don’t. I bought a Fiskars paper punch on sale at the craft store. 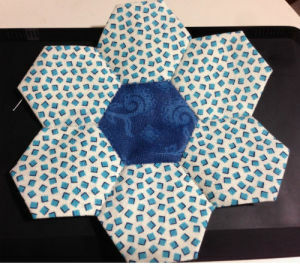 The XL squeeze punch makes perfect 1″ hexagons. Now, I can make an endless supply of identical paper forms for the cost of the initial paper punch investment — as long as I keep receiving junk mail.